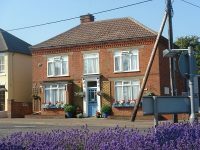 Located in a quiet country lane, this pleasantly appointed house offers comfortable accommodation and a warm welcome. Bedrooms offer a range of homely extras along with flat screen TV. Proprietors are enthusiastic and helpful, making every effort to make guests feel welcomed to their home, and freshly cooked evening meals are available by prior arrangement. The Manse is an ideal location for exploring the delights of the Wolds.